Escaping routine in style 365 days a year! Mani is one of Greece’s most traditional places with more than 800 towers, over 1000 byzantine and post-byzantine churches, 8 castles, while 98 out of the 118 traditional hamlets of Peloponnese lie here along with more than 100 caves. Among those caves, the very well known Diros Caverns, caves of superb natural beauty. Because of the great variety of nature reserves, the area has been characterised as “Botanical Heaven”, since at least 1000 plant varieties flourish here along with more than 120 Greek indigenous plant species of which 32 are locally indigenous and thus unique around the world. The climate of the area favours the olive tree which develops to produce first class olive oil. It is also due to the rich vegetation of aromatic herbs and vegetables in the area that Mani produces honey of superb quality. There are many cobblestone paved trails, ideal for hiking and six of the best canyons of Greece, very well known to many hikers. In Mani you can find picturesque sand or pebble beaches with clear waters for romantic but also family holidays. based on ours customers’ rating. Since the beginning of our hotel, providing our customers the best of services was always a great challenge, as well as a great responsibility we should stand for. 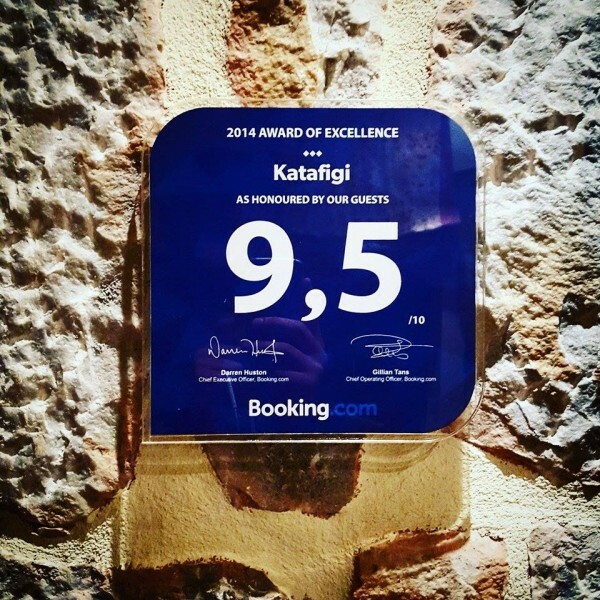 Receiving this award has been a great honor for us and a crystal clear request from our customers to continue what we are doing for over 10 years.. giving you the experience of the so called “Greek hospitality”.